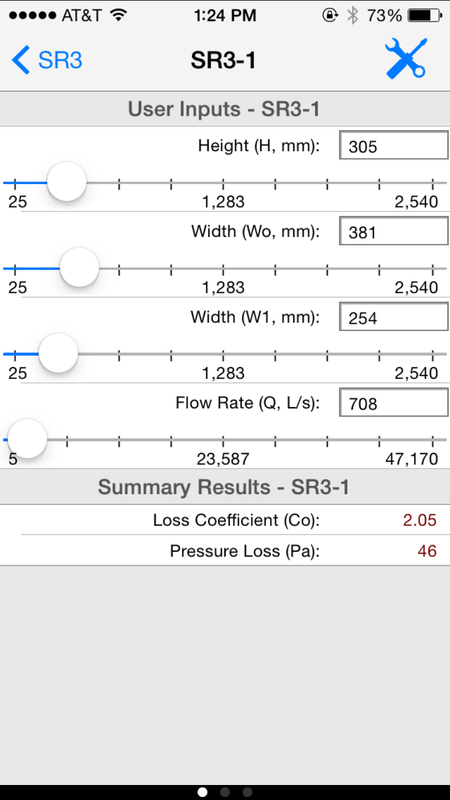 The HVAC ASHRAE Duct Fitting Database (DFDB) universal app for the iPhone and iPad allows you to perform pressure loss calculations for all 240+ supply, common, and return/exhaust ASHRAE fittings listed in the 2017 ASHRAE Handbook of Fundamentals. 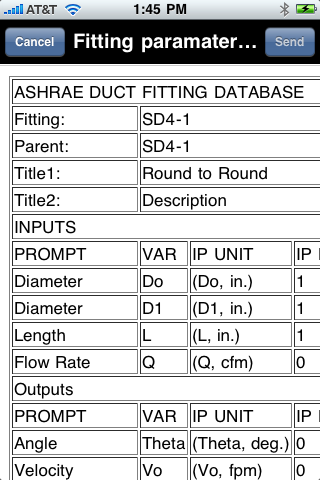 This app is based upon the popular ASHRAE Duct Fitting Database desktop application, and you can do pretty much everything in this app that you can do in the desktop program. 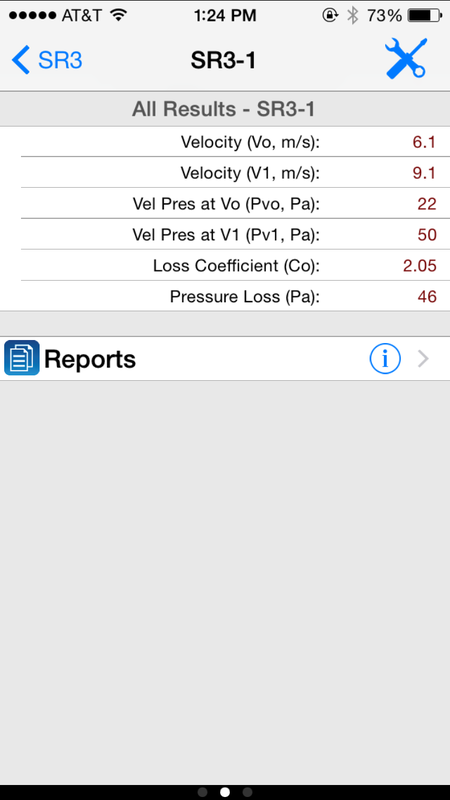 The advantage of this mobile app is that you can easily use it out in the field to do quick duct pressure loss calculations then email the results to your desktop for further analysis. The "ASHRAE DFDB" tab is the first screen that appears when you start up the application. It displays the list of DFDB projects currently available. Select any project to begin inputting values and viewing results. 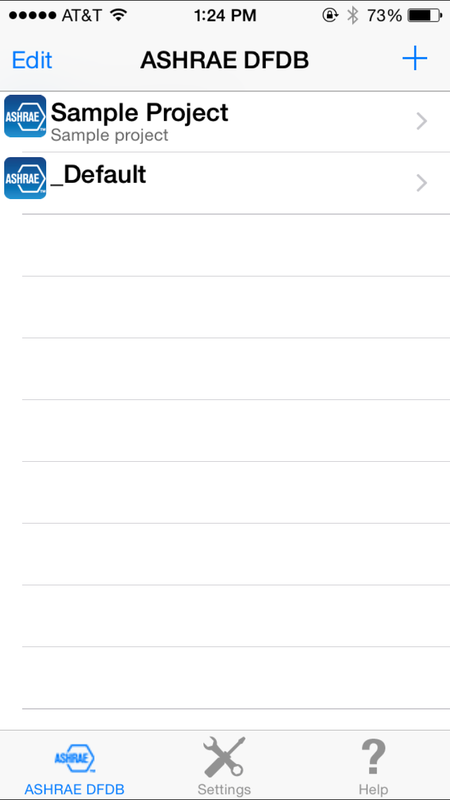 The "Global Settings" tab allows you to specify global settings such as whether to use IP (Imperial) or SI units. Read the "Global Settings" section below for more details. The "Help" tab displays this help screen. 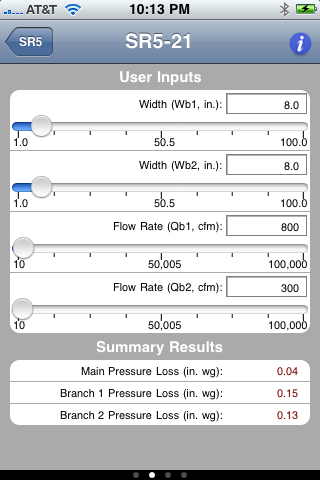 Create a New Project: A DFDB project includes fittings with inputs and results that are specific to that project. In other words, one project can have inputs for fitting SD2-2 that differ from another project with inputs for the same SD2-2 fitting. 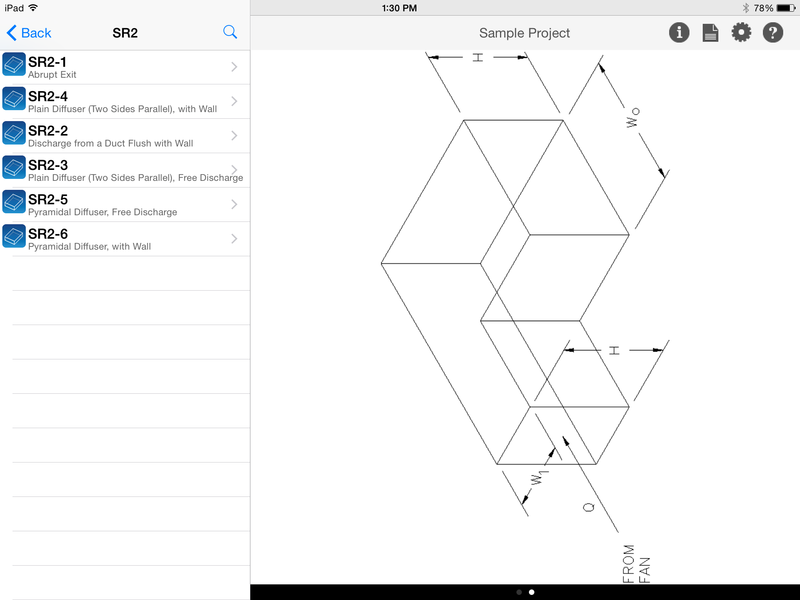 To create a new project, click the "+" button located in the upper right-hand corner of the screen. A new form will appear allowing you to enter a new project name. The "_Default" project is always used as the basis for creating a new project (See "Template Projects" below for more information on the "_Default" project). 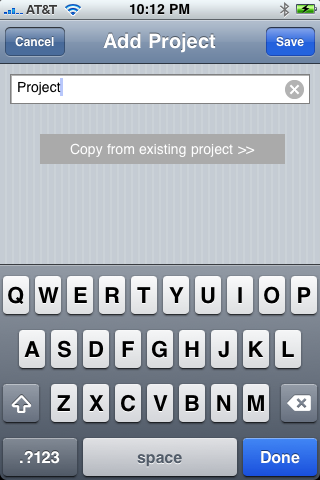 Also, you can copy from an existing project by pressing the button labelled "Copy from existing project >>". A list of all existing projects will appear allowing you to select from one. When you return to the "Add Project" screen, type in a new project name. Edit an Existing Project: To edit an existing project, select the project name with your finger and the next form will slide onto the screen allowing you to input information about the project. Delete an Existing Project: Swipe your finger across the name of the project that you wish to delete. A "delete" button will appear allowing you to press it to delete the project. The template or "_Default" project is the base project upon which all new projects are derived (except for those that are copied from existing projects). You can edit this template project at any time and any new projects derived from this template project will reflect those changes. Project name: This is the name that you originally inputted when you created the project. You can change the project name in this text box. To do so, tap your finger within the text box and the standard iPhone keyboard will pop up allowing you to type in a new name. This keyboard will appear anytime you tap your finger within any of the textboxes in this app. Project description: This is a description of the project that will display on the project list form. Project date: This is the project date which is automatically created when you create the project. You can override this value at any time. Supply Fittings: Select this option to display the form that lists the main supply duct fitting categories from which you can drill down to display individual supply duct fittings. Common Fittings: Select this option to display the form that lists the main common duct fitting categories from which you can drill down to display individual common duct fittings. 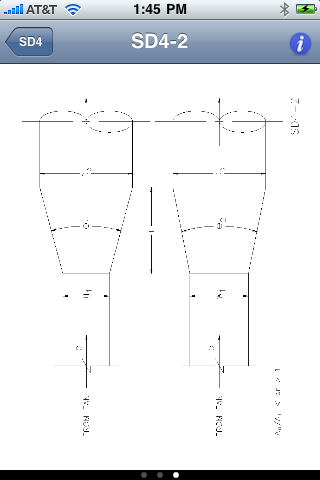 Exhaust/Return Fittings: Select this option to display the form that lists the main exhaust/return duct fitting categories from which you can drill down to display individual exhaust/return duct fittings. Search: From any of the selection screens, you can select the search icon located in the upper right-hand corner to display the search form. This form allows you to search for any fitting by typing in the fitting key. As you type in the key, the list of fittings will expand or contract depending upon the match criteria. 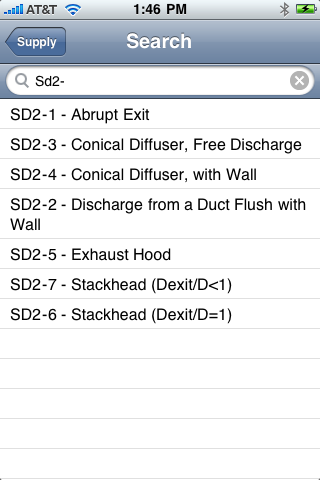 For example, if you type in "SD2-", it will display a list of fittings that satisfy this criteria. 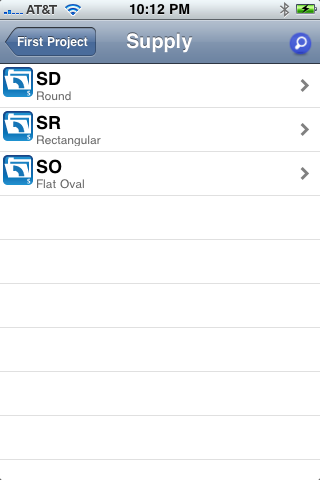 Once you type in "SD2-2", then just the one fitting will display in the list. 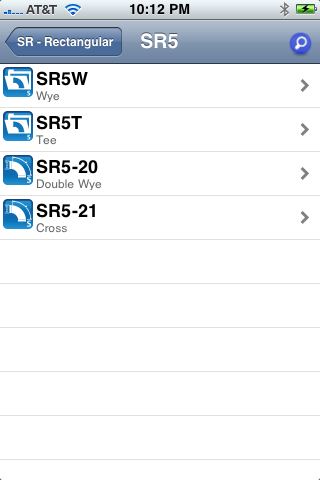 Then, you can select this fitting to go directly to the SD2-2 input/result forms. When you select a fitting category (such as "Supply Fittings") from the project input form, it will then display a list of the main suppy fitting categories seen in the screenshot below. Next, you can select any of these fitting categories, to further drill down to more specific supply fitting categories or even the supply fittings, themselves. 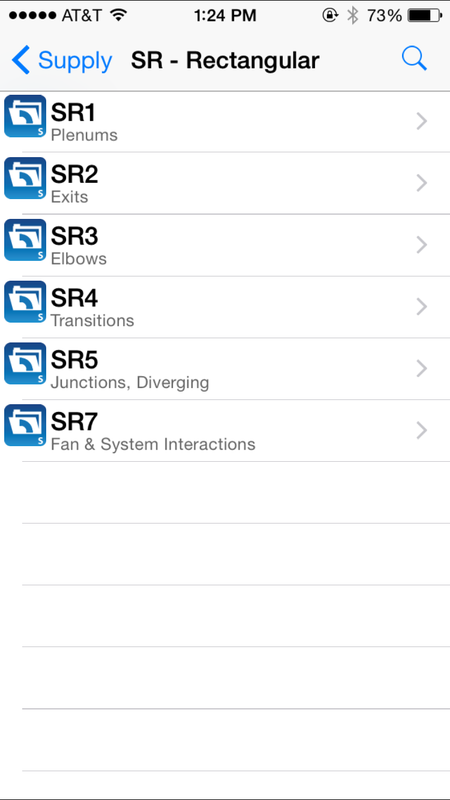 A fitting category is specified by an icon with a folder that contains a 90 degree elbow. A fitting is specified by an icon with a 90 degree elbow (no folder). When you select a supply fitting, itself, the next screen will display the inputs and results for that fitting (discussed below). The inputs and results are spread out over multiple screens. 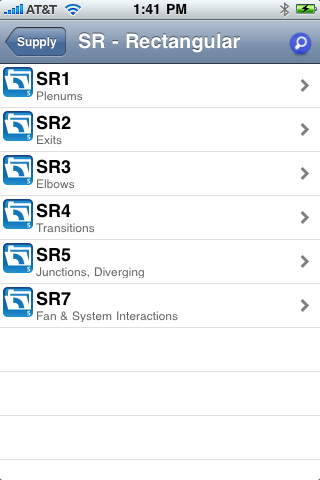 To navigate from one screen to another swipe the screen from left to right with your finger. Depending upon the fitting type, user inputs may appear on multiple screens. Each input allows you to specify a value by either typing a value directly into the textbox or moving the indicator along the slider control located below the textbox so as to increase and decrease the value by a specific step value (specified in the settings form discussed below). As you input the values, the results update immediately. 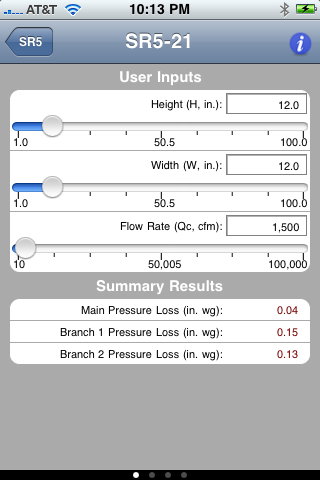 For example, at the bottom of all of the user input screens, a couple of the summary results will appear such as the coefficient of loss and the total pressure loss. Inputs and Results: Select this report to display a list of all of the inputs and results along with units, values, labels, and even a fitting graphic. This report can be sent as an HTML email along with a spreadsheet attachment. 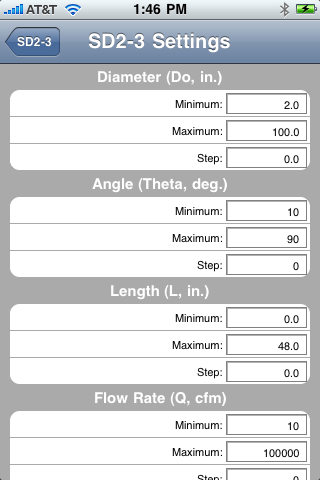 Parameters and Equations: Select this report to display general information about the selected fitting including fitting name, description, input and output labels and units, equations used to calculate the results, and a fitting image. This report can be sent as an HTML email along with a spreadsheet attachment. This form is accessed by pressing the "i" button located in the upper right-hand corner of the fitting input/results screens. 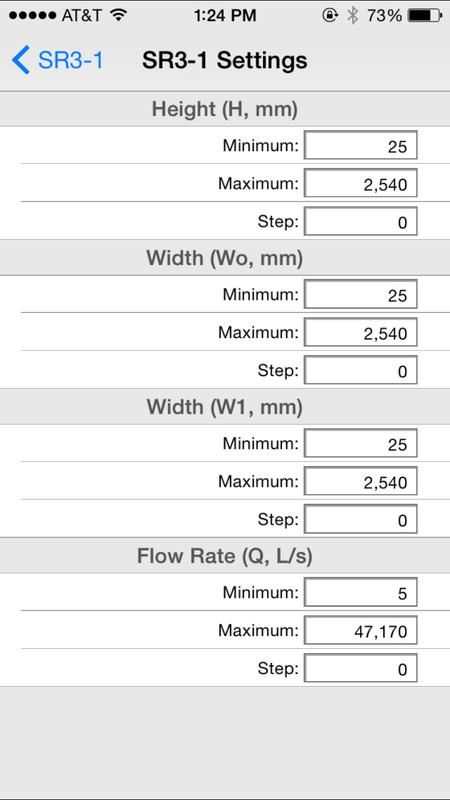 The fitting settings form allows you to specify minimum/maximum and step values for all fitting inputs. When you return to the main input form, the min, max, and step values will all update. Units: This selector allows you to specify whether to display all values in IP (Imperial or English) or SI (Metric) units. When you return to the main input forms, all values will reflect the new units. 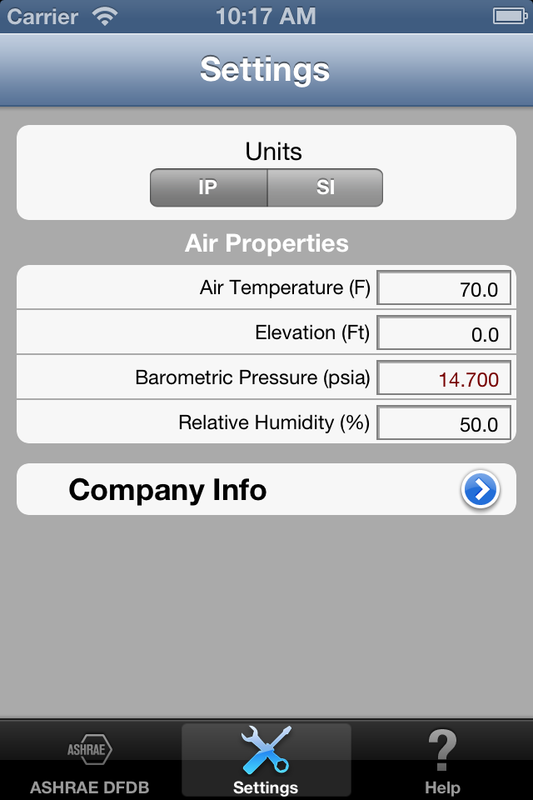 Air Temperature (F or C): Input the temperature of the ambient air. 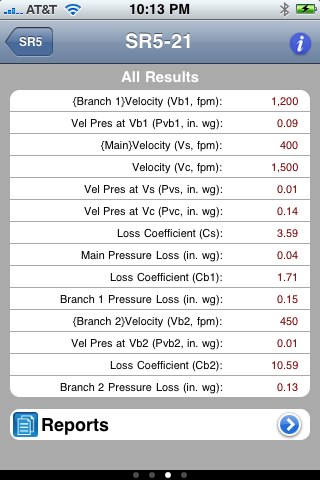 This affects the pressure loss calculations. Elevation (F or M): Input the elevation. This value affects the barometric pressure discussed next. Barometric Pressure (in w.g. or kPa): Input the ambient barometric pressure. 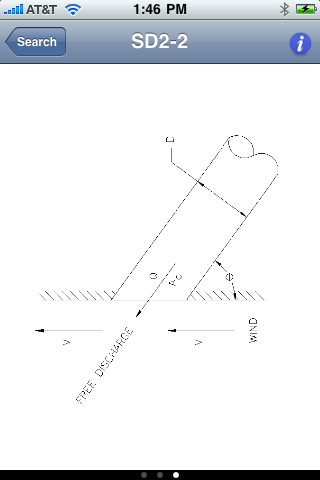 This value is automatically determined according to the elevation you inputted above. However, you can override this value. Relative Humidity (%): Input the ambient air relative humidity from 0 to 100%. 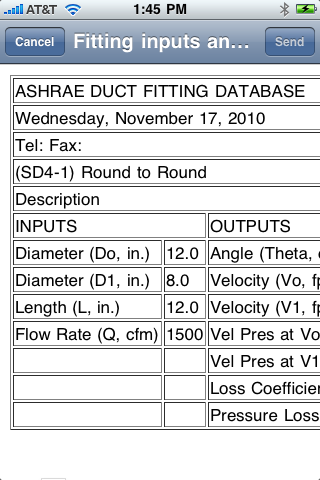 The formulas used to calculate the HVAC ASHRAE DFDB results are based upon calculations and pressure factors from the desktop-based ASHRAE DFDB software tool sold by ASHRAE and also the 2013 ASHRAE Handbook of Fundamentals.